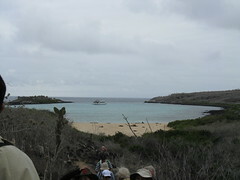 In the morning we walked on a trail for about 1.5h on Santa Fe Island. We saw lots of sea lions, land iguanas (which are different from marine iguanas – they are yellow and red in colour and live exclusively on land, whereas the marine iguanas are black and have to go into the ocean to eat algae as their food source), some amazing cacti, a tree called the palo santo (the sap is burned as incense), crabs, lots of birds like the oyster catcher, finches, a rare gull (the guide couldn’t remember its name it was that rare! ), pelicans, and yellow finches. We started our first full day in the Galapagos at Puerto Suarez on Isla Espanola. After breakfast we headed to the island and went for a walk. As soon as we got off the dinghy we were greeted by sea lions. We headed over to a small beach, where there were even more sea lions. It was incredible how close we were! We were always supposed to keep 2m between the animals and ourselves, but sometimes that was actually impossible because they would be right on a trail. We walked for probably about 2 hours, stopping often to watch animals and birds. 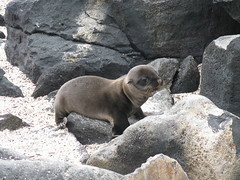 The main reason we decided to go to Ecuador was to see the Galapagos Islands. We figured this was probably a once in a lifetime trip, so we took a one-week tour on a boat through the islands. There are both shorter and longer tours, but I think the week-long trip was a good length. The trip was amazing; it definitely exceeded our expectations. Our boat, the Archipel I, was a 16-passenger motor driven catamaran. 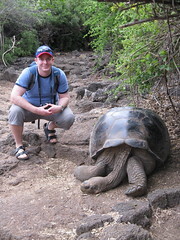 We had a local naturalist guide trained in the ecology of the Galapagos who was very knowledgeable. The accommodations on the boat were quite comfortable, and the food was excellent. 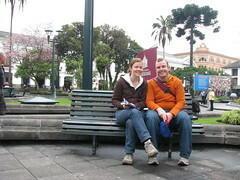 Dave and I just got home for a three-week vacation in Ecuador. We had been hoping to go on this trip for a couple of years now. Originally, we had wanted to go for our honeymoon, but after realizing how much our wedding was going to cost, we opted for a cheaper option! So, about two years later it was finally the right time, with Dave done his MBA and enough vacation time in the bank. It was an amazing trip, and I will write about it in several posts because there is so much to say! We also have a tonne of photos.